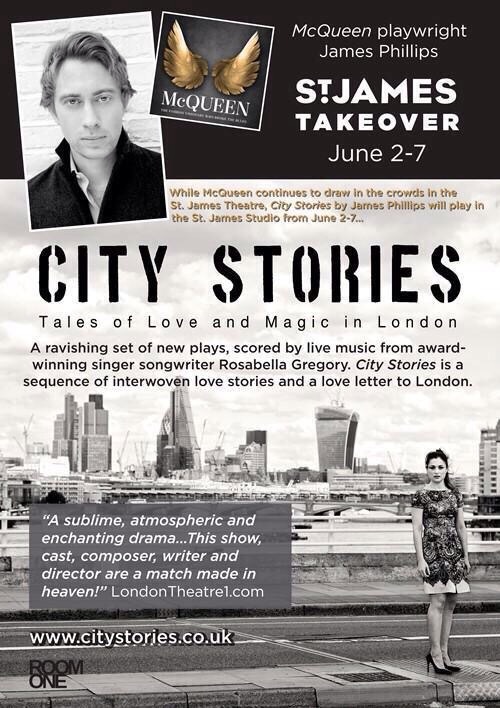 James Phillips totally takes over St James Theatre next week when he has McQueen playing in the main auditorium and City Stories being played in the studio. I was really grateful that he took time out to answer my questions for me. 1) How did your career start? What came first for you? I started as an actor, briefly, but then I started directing. I’d directed a lot at college and I was lucky: my first professional show as a director Michael Grandage came to see and he liked it a lot. He asked me to go up to Sheffield to direct for him there. I didn’t start writing till later. As a playwright it was an unusual journey. One day I’d seen a photograph in a book, of a couple kissing in the back of a police van: New York City, 1950. The couple were the Rosenbergs. They’d been executed for giving the secret of the atomic bomb to the Soviet Union. Their children still maintained their innocence. I kept asking young playwrights my age to write a play about them for me to direct, but no-one would! So I wrote it myself. And so that chance sighting of a single photograph became ‘The Rubenstein Kiss’. I became a playwright because there was a story I wanted to tell and no-one else would do it. 2) Where did the concept of City Stories come from? City Stories is really a heart love project. They’re love stories all set in contemporary London, all scored by live music. It came from an initial story, “ Lullaby”, that Daphne Alexander loved and suggested I made a sequence. Then I brought in Louisa Clein (who played Anna Levi for me in ‘The Rubenstein Kiss’) and Sarah Quintrell (a wonderful actress who I’d seen in ‘The Railway Children’) and wrote pieces for them. And I met Rosabella Gregory, a brilliant singer songwriter who was an old friend of Daphne, who wrote music for me. Rosabella and I work very closely together on City Stories, and we’ve recently released an album of her songs for the show. In fact Elaine Paige played one of them on her Radio 2 show recently, sung by Alexander Hanson (who played ‘Stephen Ward’ recently for Andrew Lloyd Webber, and is a City Stories Company Member who’ll be playing in our June dates at St James Theatre). 3) Is there any out of the current stories that’s a particular favourite of yours? I love them all! I suppose our newest story, “Carousel” deserves a mention. Alan Cox has joined the company to be in it, and it contains an absolutely astonishing new song from Rosabella. But I love them all, Pearl, Narcissi, all of them. Actually I think a particular audience favourite is “Occupy”, a story set beneath St Paul’s Cathedral. Scott Handy, who’s just finished in Rupert Goold’s ‘Merchant of Venice’ is a Priest who’s a member of a special order of clergymen. Their job is to guard the letters that people write to God, prayers and pleas and hopes, and that are sent in the post to the Great Cathedral. 4) You mentioned that there will eventually be 9 in the repertoire, your time has obviously been taken up recently with McQueen and soon to be with Camelot have you got a timescale for any new city stories this year? There will be new stories later in the year for certain. I’ve got a lot of it mapped out in my head. It’s just time. I know the next one for example. “McQueen” has been the most wonderful thing to work on, but it’s a huge show with a huge workload. And my next new play “Camelot: The Shining City” was written during the first three months of this year, and opens in July at the Crucible. That’s got a cast of 150, so it’s no small thing for us to realise either..
5) I know you are a very talented photographer along with being a writer, director and more, if you had to choose only one of these to continue what would you choose? That’s very kind of you! I suspect I’ll always write. But all of them- writing, directing, acting even documentary photography- it’s all storytelling really. 6) How did you come by the idea to write a play about Alexander McQueen? I was initially asked by a commercial producer but it took me a long while to say yes. But I fell in love with his talent, and his ravishing fashion shows. McQueen’s work is made with the love that kisses with teeth, and I think that’s a profound lesson for anyone who makes stuff for a living. And then I suddenly saw a way not to write an obvious a,b,c,d bio-play but to write a type of fairy story. And there it was. “McQueen” is really a “City Story” actually: set in magical London, full of music, concerned with love and how we survive the night. 7) What shows have you enjoyed watching recently outside of the one’s you are involved with? I’ve been so horribly busy I haven’t seen enough work recently, which is a shame. Loved “Bad Jews” at St James, and “Accolade” with Jay Villiers and Alexander Hanson- who are in my gang. “Testament of Mary” was sensationally good, and I totally loved that horror movie “It Follows”. Just been catching up on Tracy-Ann Oberman’s radio plays (she’s Isabella Blow in “McQueen”) too. 8) When it comes to casting have you always got a vision for who would be right for a particular role? For instance the casting for Alexander McQueen from a visual aspect seems inspired did you know who you’d like from inception? It totally depends on the show. Some “City Stories” are written with certain people in mind. So I always knew Scott Handy would be originating the central character in “Occupy”. With “McQueen” we knew we needed a sensational actor able to carry this vast show. And we knew we wanted to find someone who came from a similar background to Alexander McQueen, to root the part and the play. So Stephen Wight, who does also bear an astonishing resemblance to Lee, was perfect. And he’s just mesmerising in the role. 9) Is there a particular actor/actress that you would love to work with but haven’t yet had the opportunity? There’s so many I couldn’t pick one out! We have an extraordinary resource in this country: the best actors in the world. But also you’re always looking out for the chance to work again with brilliant people you’ve already made stuff with. Samantha Bond and Will Keen who were in “The Rubenstein Kiss”, Rosamund Pike who I worked with a lot as a student, Helen McCrory and Indira Varma who I worked with on a show at the Almeida. We have such talent in this country. 10) What’s your future plans? Well I’m straight up to Sheffield after City Stories to go into rehearsal for “Camelot: The Shining City” with the Crucible and Slung Low. More “City Stories” are going to be written to finish the sequence and we’re planning to take that to New York. There’s a couple of other plays being spoken about. And there’s a film I’d like to make. 11) Who would you consider to be the most positive influence in the world today and why? Difficult question! Of people I have actually met I’d say last year I was hugely impressed by Dr Usama Hasan and Maajid Nawaz’s Quilliam Foundation, who helped me whilst I was writing “The White Whale”, which we did last year in Leeds. They’re a brave group working to counter extremism. I suspect they’ll help find a way to change the world for the better. 12) If you could have a super power what would it be? I’d like to be able to step through time.